Please select the "Check-in date" and "Number of nights". When you click the "Book with the details above" button, the booking form pops up. * All nights from the 2nd night will be discounted by 10%. *Due to prior reservations the number of nights requested is not available. All nights from the 2nd night will be discounted by 10%. Please use the Rate Simulator for calculating the total charge. 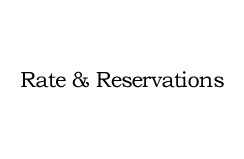 Please click the blue circle icon on the date you would like to stay in the reservations calendar. A reservation form will automatically open. Please fill in the form and click "send" button. Oversea customers who have paid via PayPal will receive a tentative reservation email from us and also an email from PayPal within 1-3 days. Customers who have paid by bank transfer will receive a tentative reservation email from us. Within 7 days of receiving the email, please pay the full amount using your PayPal account or bank account. * If payment by PayPal or bank transfer has not been made within 7 days, your reservation will be automatically cancelled. Unoan will send a confirmation email after the payment. *Our reservation calendar will only show the next 3 months of vacancies. But those guests who hope to stay more than 3 nights can make earlier reservations. Please contact us directly through the Contact Us Form. We are afraid that we do not offer child rates. For those children who are small enough to share a bed with a parent, there is no charge. Unfortunately we cannot accept pets or groups under 18 years of age unless they are accompanied by an adult. Smoking and using fire in any way is completely forbidden in the premises. We do not provide free cleaning services, fresh linen or towels if you are staying for less than 3 nights. The cleaning service and these items can be available for additional1500 yen per person. Please let us know in advance.